Subcutaneous nodules of the scalp are common and usually benign. We describe a case that presented as a probable inclusion cyst or lipoma of the scalp that was discovered to be a benign osteolytic fibrohistiocytic lesion of the frontoparietal skull. This ultimately was successfully treated by neurosurgery with a craniectomy, tumor excision, and reconstructive cranioplasty. Tumors of the skull are uncommon, with estimates varying between 1% to 4% of all bone tumors.1–3 They most commonly present as an enlarging soft or hard mass over the skull with or without some local tenderness. The differential diagnosis is broad and includes both benign and malignant lesions. Most lesions are radiolucent and osteolytic and are more common in young adults. Imaging studies are essential in the workup, and a biopsy is of paramount importance in establishing a diagnosis and treatment options. A 58-year-old woman presented to the family practice clinic with a lump on her right anterior scalp; it had been present for 6 months but began annoying her once her hair stylist called attention to it. The examining physician described it as a 3-cm, ill-defined subcutaneous cystic lesion and referred the patient to the procedure clinic for excision of a probable inclusion cyst. At the time of the procedure the lump did not feel as circumscribed as an inclusion cyst, and was thought to be more likely a lipoma because it seemed to be mobile. The adjacent skull felt normal. After incision through the scalp, the lesion was found to have a shiny, grayish exterior. In the process of dissection, the lesion was incised and chunks of whitish-yellow cheesy substance were extruded. When attempting to define the inferior portion of the lesion, the irregular edge of a 2.5- to 3-cm complete bony defect of the skull was palpable. The remaining subcutaneous abnormal tissue was removed, as was a component of the lesion's wall. The wound was closed. The excised material was sent to pathology. The diagnosis was a benign fibrohistiocytic lesion with scattered giant cells. Skull radiographs revealed a lytic lesion of the right frontal bone without sclerosis measuring 6 × 5.5 × 4.4 cm (Figure 1). Anteroposterior and lateral skull radiographs showing the lytic lesion involving the right frontoparietal bones. The patient was referred to the neurosurgery department at the University of Iowa. A magnetic resonance imaging scan of the brain was performed to delineate the extent of the lesion (Figure 2). There was extensive bony erosion with broad-based dural thickening (Figure 2C). There was no brain involvement. Sagittal (A), axial (B), and coronal (C) magnetic resonance imaging showing a homogeneously enhancing lesion arising from the right frontoparietal bone. Note the superior bulging of the mass into the subcutaneous soft tissue and the mass effect on the brain. 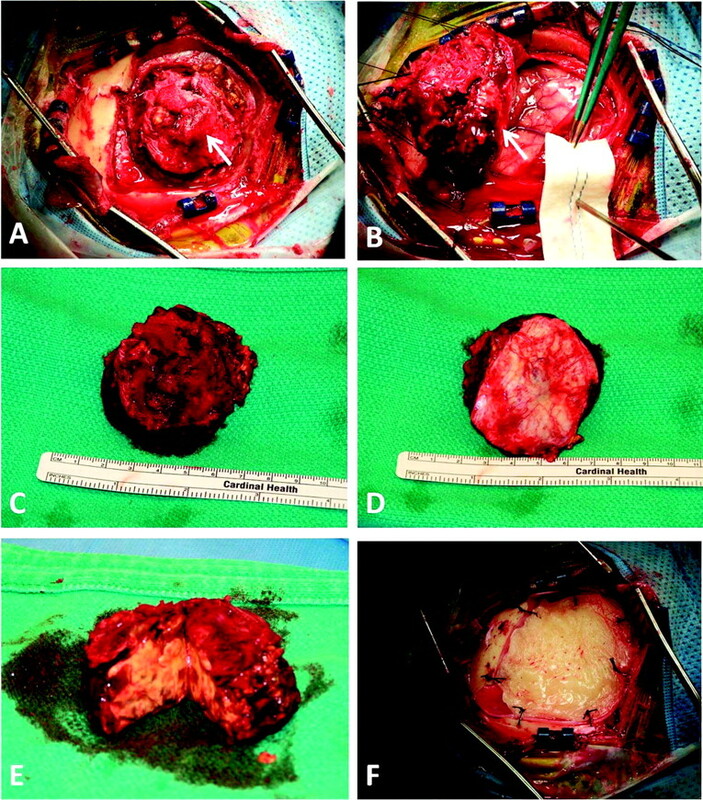 A right frontoparietal craniectomy was performed (Figure 3A). The tumor was attached to the underlying dura (Figure 3B). The subdural surface and underlying cortex were unremarkable (Figures 3B and D). A synthetic duraplasty and custom contoured polymethylmethacrylate cranioplasty were performed. The patient's postoperative course was unremarkable and she was discharged on postoperative day 2. Her immediate postoperative and 6-month follow-up magnetic resonance images show no residual disease (Figure 4). Composite operative picture depicting the skull lesion (A, arrow). The lesion was adherent to the dura matter (B, arrow). En bloc resection of the lesion, superior view (C), and inferior view (D) measuring 5.5 × 5.5 cm. Macroscopic yellowish content of the lesion is demonstrated in subfigure (E). Polymethylmethacrylate cranioplasty was performed due to the bone involvement (F). Sagittal (A), axial (B), and coronal (C) postoperative magnetic resonance imaging showing complete resection of the lesion. The final pathology was a fibrohistiocytic lesion with giant cells (Figure 5). At the last office follow-up, the patient was asymptomatic and had a good cosmetic result. No adjuvant therapy is planned; however, serial brain magnetic resonance imaging will be conducted to exclude tumor recurrence. Hematoxylin and eosin–stained sections show abundant histiocytic infiltrate present in sheets with multinucleated giant cells and lymphocytes (A) through a background of fibrous septae (B). Note the presence of multinucleated giant cells (C, arrows). CD 68 stain was used to stain histiocytes (D). Original magnification, 400×. Our patient, a 58-year-old woman, was essentially healthy with well-controlled hypertension, hyperlipidemia, and intermittent asthma. Her referral to our procedure clinic was routine without anticipation of issues other than the excision of a benign subcutaneous lesion of her scalp. The most common benign lesions of the scalp among adults are inclusion cysts and lipomas. Occasionally, these lesions have intraosseous and intracranial extension,4,5 especially if they are located in the vicinity of a skull suture. The patient did describe to the referring physician that she had felt an indentation of the skull beneath the lesion, which was not appreciated by the operating physician. At the beginning of the office procedure the lesion seemed to have completely benign features with no reported trauma, a late-life onset, nonsuture line association, was freely mobile, and had a rubbery, firm consistency.4 Therefore, a skull radiograph was not performed before the procedure. Once the radiographs were obtained, the osteolytic lesion was evident, and subsequent high-resolution imaging and definitive treatment was achieved. Our patient presented with what was thought to be a benign subcutaneous skull mass, which, after further assessment, was found to be associated with an underlying osteolytic bone tumor. Osteolytic skull tumors are uncommon and are more often metastatic than benign. Benign lesions can be locally aggressive, so definitive surgical excision typically is recommended when possible. Such excision also provides a tissue diagnosis, which is essential to guide further patient management. Received for publication December 31, 2010. Accepted for publication April 6, 2011.
. Bone Tumors: General Aspects and Data on 8,542 Cases. 4th ed. Springfield, IL: Thomas; 1986:12–3.
. Giant cell tumor of the skull. Surg Neurol 1978;9:185–8.
. Giant cell tumor of the temporal bone- a case report. BMC Ear Nose Throat Disord 2005;5:8.
. Subcutaneous nodules of the scalp: preoperative management. J Am Acad Dermatol 1991;25:819–30.
. The pathology of extracranial scalp and skull masses in young children. Clin Neuropathol 2004;23(1):34–43.
. Aneurysmal bone cyst in 29 children. J Pediatr Orthop 2002;22:533–9.
. Recurrence of giant-cell tumors of the long bones after curettage and packing with cement. J Bone Joint Surg Am 1994;76:1827–33.
. Langerhans' cell histiocytosis: pathology, imaging and treatment of skeletal involvement. Pediatr Radiol 2005;35:103–15.
. Benign osteoblastoma of the occipital bone: case report and literature review. Neuropathology 2006;26(2):141–6.
. Bone tumors–osteolytic–ill defined. Available at: http://www.radiologyassistant.nl/en/4bc99b494a9bd. Accessed 25 September 2011.
. Solitary skull metastasis as initial manifestation of hepatocellular carcinoma. World J Surg Oncol 2008;6:66.
. Malignant giant-cell tumor of the parietal bone: case report and review of the literature. Neurosurgery 2001;48(2):424–9.
. 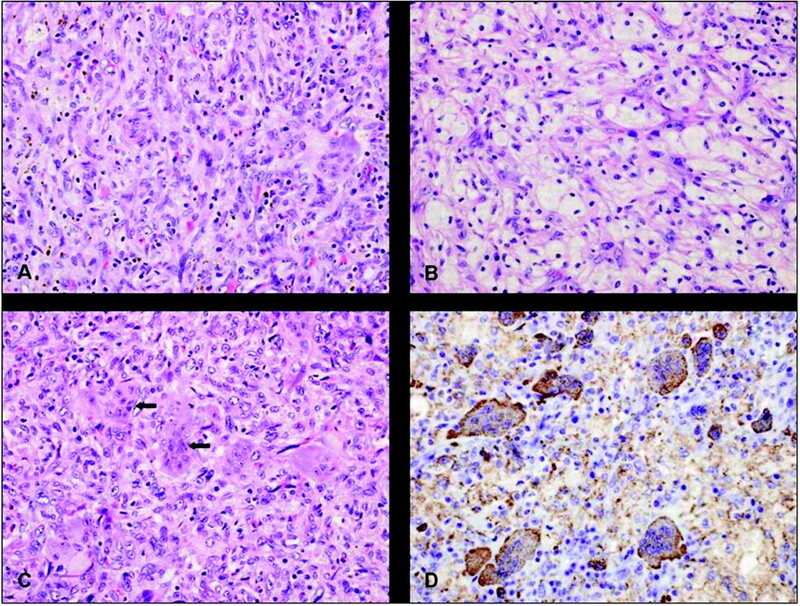 Giant cell tumour and central giant cell reparative granuloma of the skull: do these represent ends of a spectrum? A case report and literature review. Pathol Oncol Res 2009;15(2):291–5.
. Giant cell tumor of the skull. Cancer 1992;70(5):1124–32.